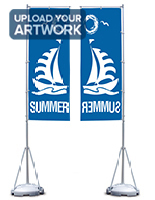 This Banner Flag with 13' Stand is a Comprehensive Outdoor Promotional Solution! The Web Catalog Provides the Best Flagpoles, Signs and Feather Pennants at the Lowest Costs! Purchase a Banner Flag Set Now and Start a Fresh Advertising Campaign! This banner flag comes with our TriPole stand and complete coloration custom graphics of your choice. Each of these flagpoles and signs is equipped with a 13ft. 1in. 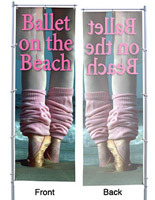 pole that is practical for concerts, festivals, trade shows and other public events. 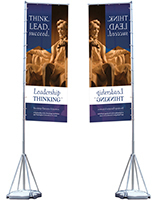 This banner flag, also called a feather display, is sized for holding 31-1/2" wide by 94-1/2" high signs. Because the flagpoles stand are so massive, they provide a high-flying method for advocating sponsors, publicizing goods or explaining available services. Even though they are built to be strong enough for reasonable weather, each banner flag is highly functional as an indoor fixture. 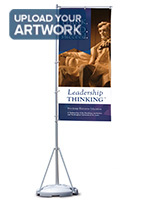 The advertising displays have aluminum telescopic flagpoles that collapse for concise storage. In addition, this banner flag can be set up in a matter of minutes by one person. Pennants are mounted to the flagpoles at ground level, and then each segment is elevated and locked in place. 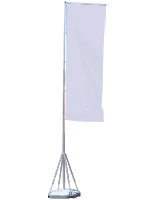 The horizontal flag armature at the crest keeps banner flags clear and visible. This arm also allows a display to spin around with wind gusts. At the base of the display, a three leg support allocates wind loads. The stability of the unit is enhanced when sand or water is used to fill the included plastic bases. These bases conveniently fit inside enclosed travel bags when traveling to and from locations. 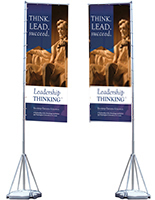 Full-color custom feather displays come with the banner flag packages. Images are printed onto a durable knitted polyester fabric using a large format digital printer. Digital printing does not require a minimum order and is available for quantities less than ten. Digitally printed displays are also a better option for multifaceted layouts, photographic images or art that features gradients. The downside to digitally printing signs is that it does not offer as high of color penetration as with silk-screening. For example, while your images are visible on the back, they are not as vivid as the front side. 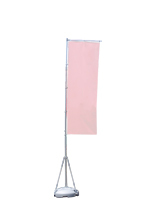 This banner flag with carrying bag is an intelligent purchase for any outdoor promotional task. 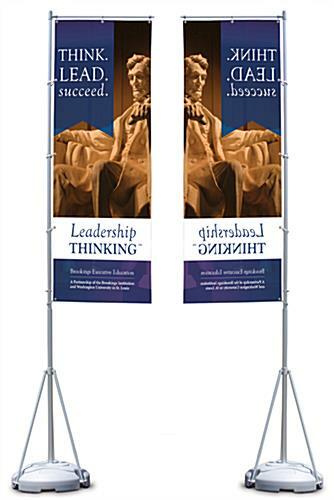 We are proud to offer signs for these TriPole banner flag systems. We have researched many different options and have come up with an answer that we feel is best and most reasonably priced. These are real flags that will blow in the wind, not heavy vinyl banners. Although they are not the most inexpensive banner flags you may find, with proper care and use they will last for years without fraying while sustaining little to no fading.